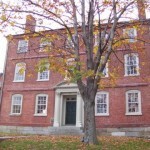 Salem State University is reported to have many ghosts, including the spirits of a student who hanged herself and a man in black in Gramley Hall, two girls who were electrocuted at Gramley Library, a little girl who died in the elevator shaft at Clewell Hall, and a haunted portrait in Babcock Hall. The halls you’ve listed are not at Salem State University in Salem, MA. You are referring to buildings at Salem College in Winston-Salem, NC. Please fix these errors! Oooh! moving into Salem State this summer! Can’t wait for the ghosts!